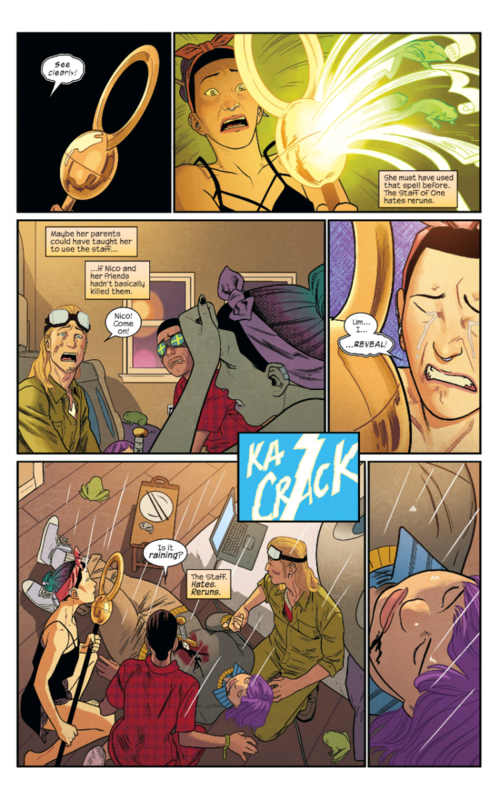 When RUNAWAYS debuted in 2003, there really wasn’t anything else like it on comic shelves. We were introduced to a group of teenagers who found out their parents are all supervillains trying to destroy the world. This was during Marvel’s Tsunami, where they threw a lot of new characters and concepts at the wall to see if any of them stuck. While most of the other Tsunami books basically faded, The Runaways have stuck around for several volumes and the various characters have appeared in other books as well. Alex Wilder - son of mafia crime bosses, and a master strategist. Nico Minoru (formerly Sister Grimm) - daughter of dark wizards, armed with the mystical Staff of One. Karolina Dean (formerly Lucy in the Sky) - daughter of alien invaders with solar energy-based powers. Molly Hayes (formerly Bruiser or Princess Powerful) - daughter of telepathic mutants, and possesses the mutant powers of super-strength and invulnerability. Chase Stein (formerly Talkback) - son of mad scientists, armed with his father's Fistigons and a naturally skilled pilot. Gertrude "Gert" Yorkes (formerly Arsenic) - daughter of time-traveling criminals, possesses a telepathic link with her genetically-engineered dinosaur from the 87th century. Old Lace - Gert's pet dinosaur. The new RUNAWAYS series promised to reunite the original team (except for Alex who is busy being evil in comics like LUKE CAGE AND IRON FIST). Which was a bit of a surprise since Gert was dead. And that is exactly where this issue starts. Chase has decided to go back in time and save Gert’s life. But, he is slightly too late; she has already been gravely wounded. He brings her back to today, and asks Nico to use her magic to save her. The problem is that Nico is running out of spells. The Staff of One can only do a spell once, and she’s been using it so long that she is running out of spells she can use. This entire issue is basically Nico working around that limit to bring Gert back. It needs to be accessible to new readers. The team should be all together by the end of the first issue. This comic failed these criteria immediately. We don’t even get an indication of where Molly and Karolina are by the end of the issue. 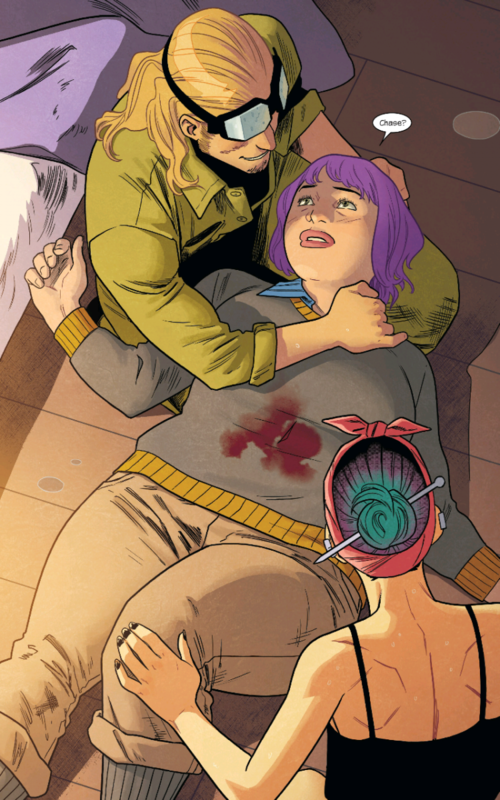 And if you had never read RUNAWAYS before, it is really hard for a new reader to just jump in on this issue and understand what is going on and why it’s so important. Hell, I had some people who had read RUNAWAYS back in the day tell me that they felt a little left out by this relaunch. I always think that is a huge mistake in a first issue. In a lot of ways, Marvel may have been better using Legacy numbering and just continuing this where the last RUNAWAYS series ended. Despite those concerns, I did enjoy this issue. I thought Rainbow Rowell did a terrific job capturing the voices of Nico and Chase. I also thought she told a real compelling story here with Nico desperately trying to figure out how to save her friend while her magic is running out. I am real curious where the series goes from here. We did get a tease at the end that someone had been watching Nico and was waiting for Chase's arrival. Kris Anka’s art was solid There wasn't a lot of action here, but Anka's art still provided a lot of drama. I actually think it's harder to draw drama than out and out action, and Anka pulled it off very well here. All in all, I think RUNAWAYS is in good hands here once it gets off the launchpad. 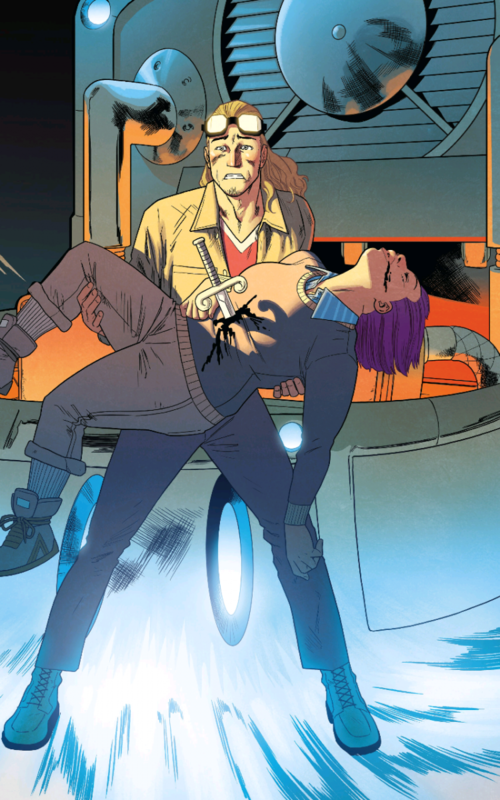 RUNAWAYS has long been a great alternative from the big event mentality that too often plagues most of Marvel’s line, and it certainly feels like Rowell and Anka can get this book back there...though they have a little more to go right now. Not a fan of team books that don’t have a team formed by end of first issue. Yes. It’s not quite perfect but it still is a great comic for RUNAWAYS fans. RUNAWAYS has been off the shelves for far too long and this is a positive step in the right direction of restoring them to their rightful position in the Marvel universe.